More than a dozen local agencies along with Oregon Sen. Jeff Merkley, D-Ore., gathered for a Celebration of Collaboration last Tuesday, March 19. Recognizing joint efforts between irrigation districts, land trusts, and energy corporations more than a hundred people gathered to express their appreciation in the midst of one of the largest modernization projects. 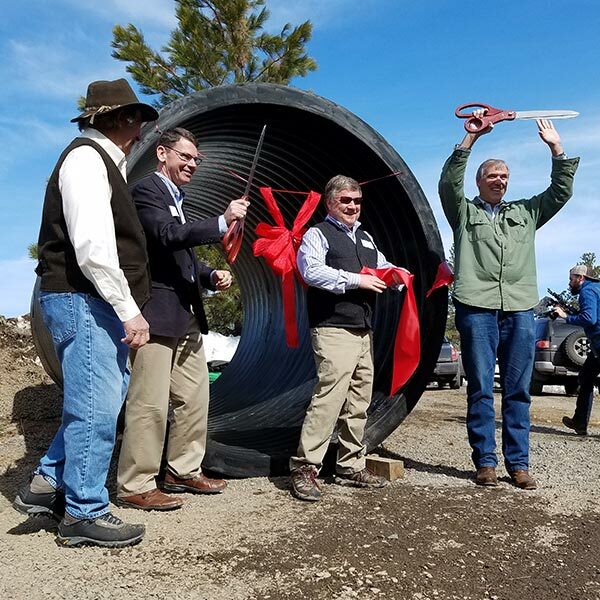 Held at the Three Sisters Irrigation District headquarters just east of Sisters, the event unveiled the new Watson Micro Hydro Demonstration Project Facility along with four new hydro turbines and a display of the new massive 84-inch piping used in local canals. For years local irrigation districts have worked to replace centuries-old open-air canals with new, pressurized underground piping. Years prior, the open canals presented an inefficient means of transporting water. The majority of water was lost through evaporation and seepage into the porous Central Oregon earth, and exposed an uncontrollable vessel for contamination. With 59 of the 64 miles of piping already complete, local irrigation district managers are beginning to see the benefits. Marc Thalacker, manager of the Three Sisters Irrigation District, says they have already restored 30 CFS of water into Whychus Creek with hopes of seeing steelhead and salmon return someday. “The last time we saw those in the Whychus was in 1885,” he said. The new underground pipe will also provide local farmers with 25 percent more water and save them from the costs of pumping their own water to their fields — a provision local farmers will find beneficial on their bottom line, Thalacker said. For irrigation districts and farms, it’s a win-win. Also participating in the ribbon-cutting ceremonies, Sen. Jeff Merkley, D-Ore., expressed his appreciation for the well-spent dollars. The Oregon Senator secured $30 million last year for the project and has played a crucial role in securing federal funding for local irrigation district projects. Merkley said he intends to keep providing for the project and overseeing it until its completion. Event-goers also had the opportunity to tour the new 200-kilowatt installation in addition to the existing 700-kilowatt hydropower electric plant. The new turbines will not only provide a similar function in creating electricity as the existing gravity-pressurized 700-kilowatt plant, but also provide a source of renewable energy suitable to farm use. The new turbines in conjunction with the new facility will produce 26% more electricity for local homes in addition to the existing 3.1 million kilowatt-hours produced annually — feeding the rapid growth of Central Oregon with renewable energy. Laying pipe in Central Oregon’s centuries-old canals and pursuing renewable energy through hydropower has been a large cooperative between all of Central Oregon’s irrigation districts. Local land trusts and energy corporations have partnered with them in developing one of the largest modernization projects to date. Piping the old canals was a project started in 2000, but in 2019 and with 11 years to go, the end is in sight. For nearly two decades they averaged 2,000-3,000 feet of pipe per year, Rieck said. But this year, 8,400 feet has already been laid, putting them ahead for next year. Fifteen years ago the Tumalo Irrigation District was in bad shape, said Reick.